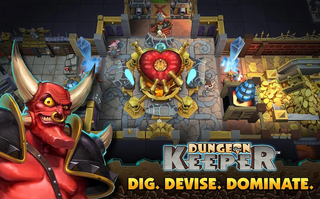 British regulators have ruled that an advertisement calling EA's controversial mobile reboot of Dungeon Keeper "free" is misleading and must be pulled. The game, which is free to download on iTunes and the Android store, requires players to make progress either by waiting lengthy amounts of time or buying in-game gems using real money. Like many "free-to-play" games, it is technically free, but difficult to play for extended periods without spending any money. This morning, in a response to complaints about an ad in which EA called the game free, the UK's Advertising Standards Agency ruled that the ad isn't kosher. "The ad must not appear again in its current form," reads the ruling. "We told Electronic Arts Ltd to ensure that future ads made clear the limitations of free gameplay and role of in-app purchasing with regard to speeding up gameplay." In February, when EA first released this Dungeon Keeper reboot, fans were outraged at the microtransactions, and EA boss Andrew Wilson has since expressed regret at how they approached this re-imagining of the classic Bullfrog strategy game.